Meet my son Thomas – he wants to blog ! I thought it was just simply curiosity my son Thomas was expressing when he began asking questions about my work. The questions became more and more focused on all the writing I do and we finally got to the crunch – he wanted his own blog. It all started as a game, a little secret between us: I told him I’d have one set up for him by Raimondo. I thought he’d soon forget as he got back to playing with his Nintendo DS and other computer games. But he kept coming back asking when it would be ready and when he could start writing. So we finally got around to setting it up and used this very cute template my Mike Yarmish – I like his style very much. We downloaded the turtle template, that Thomas choose. There hasn’t been much time to sit down and explain how to blog but this evening we finally arranged for him to write his first post. WOW ! I wish I had a photo of myself writing my first post. He was very careful about what he was writing, sat there for a few minutes and thought – it was a very important moment !! So now I am wondering where are we going to go from here … who knows. 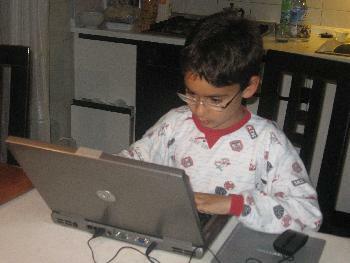 But It’s gonna be fun to teach him things as he grows (that is if he really does take a liking to blogs and blogging). 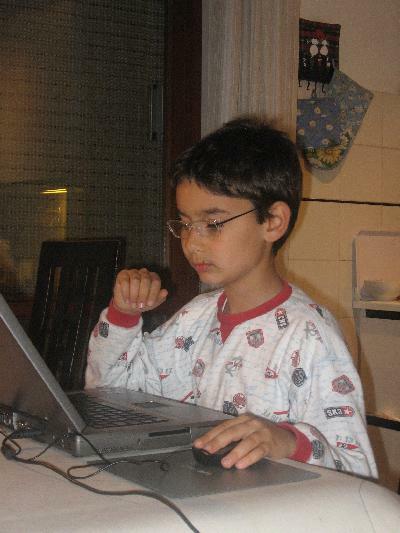 Just think if you had a blog when you were 9, to follow you as you grew up. Some of us had diaries, but I didn’t. Now I have a few boxes with photos and some papers from school. Think of what a reputation a blog can build as children like Thomas grow up to become teen agers and then professionals. What a value a 20 year old blog can have … well we’ll see where this goes. As we say in Italian in bocca al lupo Thomas !